The question on most people’s lips would probably sound something like “Are Cleansing Detox programs really good for you?” and there would seem to be an equal amount of cautions and recommendations for cleansing or detoxing, which can make it confusing for the person looking for a better way to achieve wellbeing and a healthy weight. It is possible to get it wrong, however when completed correctly you can help your body and mind in several different ways. This article outlines some of the benefits you can expect by following some of the more well-organised Cleansing Detox programs out there. There is no doubt that when Cleansing Detox correctly and properly, many people report feeling more energetic with some reporting excess vitality and mental clarity. When you think that while you are engaging with a correctly prepared Cleansing Detox program, you’ll be stopping the intake of the foods and other things that caused you to need a Cleanse Detox in the first place. By cutting out the sugar, caffeine, trans fat, saturated fat, and replacing them with fresh fruits and vegetables, you’ll be getting a natural energy boost, one that comes without a consequential crash. It’s vital to stay well hydrated while on any Cleansing Detox program, and that can also be a source of increased energy if you typically don’t get enough water throughout the day. Probably the most important benefit of a Cleansing Detox program, is assisting the body to purge itself of excess waste, usually stored in the colon (intestines). Most Cleansing Detox programs are designed to stimulate the body to cleanse itself, helping the liver, kidneys and colon (intestines) do what they do naturally. Cleansing the colon is an important part of the detoxing process because the toxins found there need to exit the body and a clogged colon can cause these toxins to multiply and cause us to become ill, rather than exiting as nature intended. Consuming fruits and vegetables during and after the Cleansing Detox program is a good way to keep things moving. A properly created Cleansing Detox program can help you to lose weight and it is the start of establishing positive long-term eating habits, and relieve yourself of unhealthy habits. In the media, there is an emphasis on drastic reduction in calories and rapid weight loss however these short-term results won’t last if you don’t make it a habit to replace bad foods with good, and use your newfound energy to exercise more and be more active overall. When you have completed your Cleansing Detox program, your organs function more effectively. They are more efficient, more energetic and more useful. This helps to give your immune system a boost since you’ll be able to absorb nutrients better, including all the essential vitamins and minerals. Many of the herbs you take while on a Cleansing Detox program will help the lymphatic system, which plays a huge role in keeping you healthy and toxin free. Many Cleansing Detox programs also focus on light exercises which help to circulate lymph fluid through the body and helps it to drain, strengthening your immune system in the process. 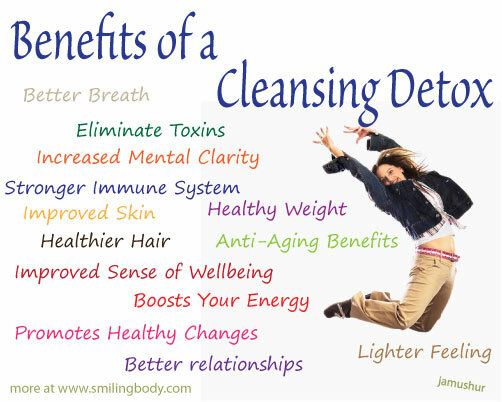 A good Cleansing Detox program will pay attention to your state of mind. Being mindful during eating helps us to be aware of the foods and beverages we are actually eating and drinking at the time, so the use of mindful meditation is recommended as a way to get back in touch with your body during this time of purging and cleansing of toxins. People say that they lose that sense of mental cloudiness, and are able to think more clearly during a detox than when not on it. It makes sense, since much of the foods that contain sugar and fat will cause us to feel lethargic and can faeture heavily in the quality of our thinking. Your skin, being your largest organ, also benefits from your Cleansing Detox program. One way to help your cleansing efforts is to take a sauna to help the body sweat out additional toxins. You can expect clearer, smoother skin as you proceed with your program. It’s also been scientifically reported that a Cleansing Detox program can help with acne, although the condition may worsen before it gets better as the toxins are released. You may find that your skin itches or gets patchy before clearing up, but this is part of the process and is a sign that you’re on the right track with your program. Follow a Cleansing Detox program that includes a colon (intestines) cleanse because those toxins need to be released from the body. When the colon is clogged, the resultant stench can back up to the mouth and result in bad breath. When your colon eliminates efficiently, your digestive system benefits by functioning well again. 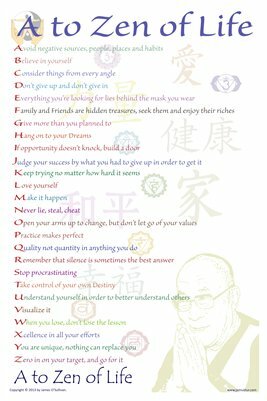 You may find that your breath improves. Be aware that your breath may actually worsen during the detoxing process, but when it’s finished it will be better. This is natural, and occurs as toxins are released from the body. It’s hard to change a long-standing habit, and a Cleansing Detox program, no matter how long, is one way to put a wedge between your old ways and your new ones. If you have addictions to sugar, caffeine, fried, or crunchy foods, you can use a Cleansing Detox program to help you deal with those cravings. 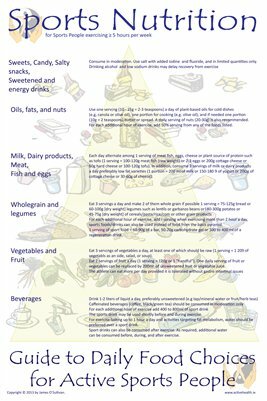 Often trying to eliminate these foods and beverages from our diet can be difficult unless we completely change our nutritional habits. This is where a Cleansing Detox program comes into its own by cleansing the body and replacing poor foods with healthier choices, you can retrain yourself and be more likely to stick to your new habits. You’ll see and feel the difference in your hair, when your hair is able to grow uninhibited by internal toxins. By the time you can see your hair, it’s already considered dead, as all of its growth occurs within the hair follicle. This is why it’s important to keep your body functioning at its full potential through a Cleansing Detox program. In many instances hair gets shinier, and feels softer to the touch. Cleansing isn’t enough to stop male pattern baldness, but many report that their hair grows more quickly, a sign of healthier hair. One of the reported benefits of Cleansing Detox program is a feeling of being lighter. There are several reasons why this would be the case, especially if you’ll be doing a colon (intestines) cleanse as part of the program. When you stop eating foods that weigh you down, and replace them with fresh organic fruits and vegetables, a lighter feeling is bound to occur. It’s also important not to overeat while on your Cleansing Detox program, which will yield a lighter feeling, and will give you the energy you’ve been missing. Ever heard of free radical activity. This is the activity caused by toxins and poor food and drink. many scientists now believe that aging is the result of free radical activity and that where we introduce “Anti oxidants” into our diet while eliminating poor nutrition, we could live longer and healthier. The constant barrage of toxins that the body has to deal with is one contributing factor to the aging process. By reducing the amount of free radical damage done to the body, you’re going to see not only short term benefits, but also long term benefits in an increased longevity. When you finish your Cleansing Detox program, it’s very important not to go back to the lifestyle that was causing the toxicity. Sticking to a improved diet and getting daily activity are great ways to make sure that you feel good each moment of your life. The best Cleansing Detox program leaves you feeling great and certainly not worse. When you cleanse your digestive system, you feel good, and when you feel good, good things happen. Cleansing is often used strategically to lose weight or to start a new nutritional program, but really there’s no better reason than just to feel better. When you set the stage for wellbeing, you are going to improve all areas of your life, and you should see better relationships, better productivity at work, and a newfound or renewed zest for life. 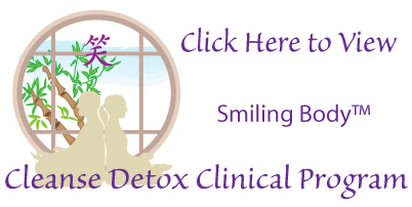 Learn more about the Smiling Body™ Cleansing Detox program. This entry was posted in Conditions, Nutrition on by smiling.